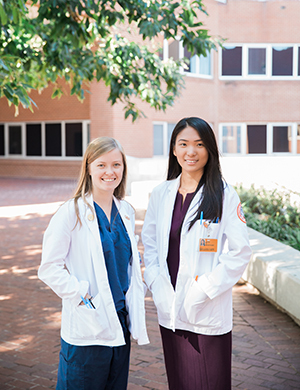 The UT Graduate School of Medicine recently awarded the Earl and Virginia Hord Endowed Scholarship to third-year UT Health Science Center College of Medicine students Kristen Campbell and Jennifer Wu. The Hord scholarship is a two-year award offered through the Graduate School of Medicine to COM students completing their full third and fourth years in Knoxville. The scholarship is given for demonstrated excellence in academics and requires a 3.0 GPA or above be maintained. Both students said they chose Knoxville for their third and fourth years of medical school to take advantage of the smaller rotation sizes, allowing for more one-on-one time with attending physicians and residents. Campbell said, "We have the ability to directly interact with attendings and residents and not get lost in the crowd of students." Campbell and Wu also both said they have support systems in Knoxville through family and friends, which can be a great advantage to providing balance to the demands of medical school. Ultimately, the scholarship provides relief to the burdens of paying for school so that the students can focus on their education. Wu said, "I can't imagine how different my education would have been if it weren't for scholarships like Hord, and I'm all the more grateful that this exists."